National Call In Day for #TravyonsLaw! Please join the Dream Defenders, who have been sitting in the FL capitol for NINE DAYS now, to pass #TrayvonsLaw, by calling Governor Rick Scott to demand he call a special session of the legislate to enact Trayvon’s Law, repealing Stand Your Ground, banning racial profiling, and ending the School-to-Prison Pipeline. Hello, my name is _______ and I’m calling from ________. As a citzen of Florida/the nation, I am calling to say that I stand with the Dream Defenders and youth across Florida. I am concerned that the verdict in the Zimmerman trial indicates a failure to value the lives of all Floridians. I am asking Gov. 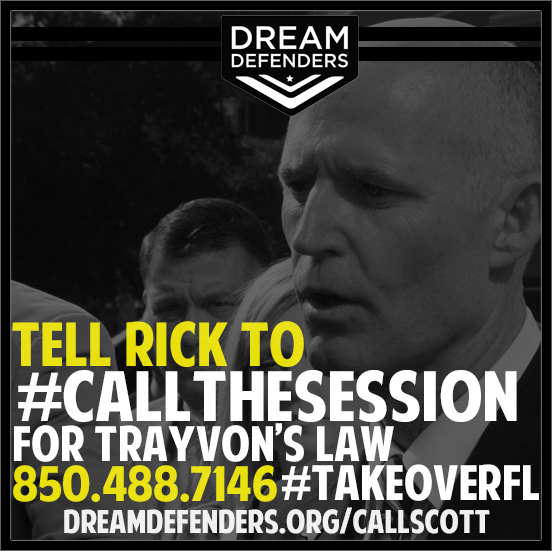 Scott to call a special session of the legislature and urge to enact Trayvon’s Law.